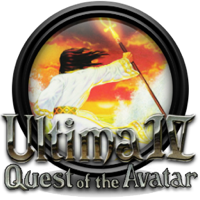 Ultima IV differs from most RPGs in that the game's story does not center on asking a player to overcome a tangible ultimate evil. After the defeat of each of the members of the triad of evil in the previous three Ultima games, the world of Sosaria underwent some radical changes in geography: three quarters of the world disappeared, continents rose and sunk, new cities were built to replace the ones that were lost. Eventually the world, now unified in Lord British's rule, was renamed Britannia. Lord British felt the people lacked purpose after their great struggles against the triad were over, and he was concerned with their spiritual well-being in this unfamiliar new age of relative peace, so he proclaimed the Quest of the Avatar: He needed someone to step forth and become the shining example for others to follow. The object of the game is to focus on the main character's development in virtuous life, and become a spiritual leader and an example to the people of the world of Britannia. The game follows the protagonist's struggle to understand and exercise the Eight Virtues. 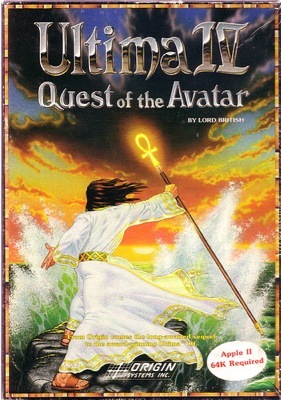 After proving his or her understanding in each of the virtues, locating several artifacts and finally descending into the dungeon called the Stygian Abyss to gain access to the Codex of Ultimate Wisdom, the protagonist becomes an Avatar. Conversely, actions in the game could remove a character's gained virtues, distancing them from the construction of truth, love, courage and the greater axiom of infinity—all required to complete the game. Though Avatarhood is not exclusive to one chosen person, the hero remains the only known Avatar throughout the later games, and as time passes he is increasingly regarded as a myth. Instead of simply choosing stats to assign points to as in the first three Ultima games, you are instead asked various ethical dilemmas by a Gypsy using tarot cards. These situations do not have one correct resolution; rather, players must rank the eight virtues and whichever stands as their highest priority determines the type of character they will play. For example, choosing Compassion makes you a Bard, Honor a Paladin, Sacrifice a Tinker, and so on. This was also the first Ultima game where you had to play as a human, it eliminating elves, dwarves, and bobbits found in previous games altogether. Although each profession embodies a particular virtue, to become an Avatar the player must achieve enlightenment in all eight virtues. Enlightenment in the virtues is achieved through the player's actions as well as through meditation at shrines. Shrines to each of the virtues are scattered about Britannia, each requiring the player to possess the corresponding virtue's Rune before allowing entry. Through meditation and correctly repeating the virtue's Mantra one to three times at the shrine, the player gains insight and ultimately enlightenment in the virtue. A seer in Lord British's castle provides the player with feedback on their progress in the virtues. Technically, the game was very similar to Ultima III: Exodus, although much larger. This was the first Ultima game to feature a real conversation system—whereas NPCs in the earlier parts would only give one canned answer when talked to, now players could interact with them by specifying a subject of conversation, the subject determined either by a standard set of questions (name, job, health) or by information gleaned from the previous answers, or from other characters. Many sub-quests were arranged around this. Another addition were dungeon rooms, uniquely designed combat areas in the dungeons which supplemented the standard combat against randomly appearing enemies. The world of Britannia was first introduced here in full, and the world map in the series did not greatly change any more from this point onward. The player may travel about Britannia by foot, on horseback, across the sea in a ship or by air in a "lighter than air device". Speed and ease of travel is affected by the mode of travel as well as terrain and wind. When purchasing goods from blind merchants the player is required to enter the amount they actually wish to pay. Although the player has the option of paying less than the merchant has asked for, this will mark the player as dishonest. Stealing gold from chests owned by others will also penalize the player. This Virtue is embodied by Mariah the Mage. By using the Give conversation subject, a player can give beggars alms and in doing so demonstrate compassion. This Virtue is embodied by Iolo the Bard. Valor is displayed by the player defeating enemies in combat and not fleeing in a cowardly fashion. This means that when retreat is necessary, the player should be the last party member to leave the field of battle. This Virtue is embodied by Geoffrey the Fighter. Not all of the hostile creatures in Britannia are evil and the player must avoid unprovoked attacks on those that are not. If attacked, he should resort to driving them away rather than killing them. Out of the eight virtues, this one requires the most finesse to embody and is a particularly good example of balancing ethical dilemmas. The player's party must stand their ground for Valor, yet drive their foes away without killing them. This Virtue is embodied by Jaana the Druid. By completing quests and exploring dungeons the player demonstrates their honor. This Virtue is embodied by Dupre the Paladin. If the player goes to a places of healing while in good health, the player can make a blood donation and sacrifice some health in doing so. This Virtue is embodied by Julia the Tinker. Meditating at shrines and achieving enlightenment in the other virtues enhances the player's spirituality. This Virtue is embodied by Shamino the Ranger. Humility: None, though it is considered the root of all virtue. The player demonstrates their humility during conversations. A boastful response to a question results in a penalty, a humble response results in a bonus. This Virtue is embodied by Katrina the Shepherd.